Workout then Cook! : I Forgot How Much I LOVE Peanut Butter! I Forgot How Much I LOVE Peanut Butter! It's been a while since I've had the good old PB and I forgot how much I love it! This recipe was adapted from the PB and J Muffins recipe from the 250 Best Muffin Recipes cookbook. I changed mine up by substituting the jam with raisins cuz I'm one of those weird people that actually don't like the combination of PB and J (don't ask!). 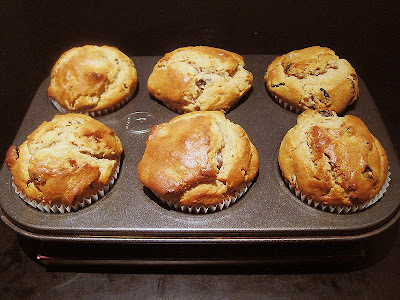 I love the rich PB flavor in these muffins and they definitely make a yummy portable breakfast! 1. Preheat oven to 375°F. Line or spray 6 muffin cups. 2. In a bowl, sift together flour, sugar, baking powder, baking soda and salt. In the bowl of a stand mixer, beat together the peanut butter, egg, milk, vanilla and butter. Stir in the dry ingredients and raisins. 3. Spoon into muffin pan, filling 3/4 full. Bake 20 minutes, until brown on top and toothpick inserted in the middle comes out clean. Getting Fancy with my Fish! 6 Chicken Thighs for How Much? Would You Like a Raisin Bran Flower? What's Cheesy, Yummy and Actually Good for You? Cheesy Bell Pepper Mini Loaves! Cute Little Oatmeal Raisin Nut Bread! Sunday Nights were made for Enchiladas! Chicken + Blueberries? Oh YEA! My Version of the ULTIMATE Lamb Curry! Lil Banana Bread with a BIG Crunch! Dusting Off That Cast Iron Pan! Fancy French Cooking at Home! I Got a Scone Pan! Mrs Fields Has Done It Again! Boring Looking but PACKED with Flavor! The Most AWESOME Roast Beef Panini! Yummy Fish Adapted from Barefoot Contessa! Can't Waste That Orange Zest! Orange + Pork = The Perfect Summer Combo!